Rockwool is made from natural melted rocks blown into mineral fibers. It has become one of the most popular medium for hydroponics and a favorite of many growers. One of my favorite things about rockwool, is that it can be purchased in many different sizes that are suitable for all the hydroponic systems you’ll be using. I like to use the small rockwool cubes for starting seeds, cloning and aeroponic systems. They are small enough to to fit in an aeroponic system and quite a few will fit into domes. 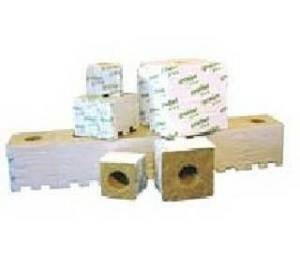 The rockwool blocks work well in NFT, drip systems, ebb and flow, hand water, wick, water culture. They come in different sizes so that you can determine which ones will work best for your plant size. The rockwool slabs are well suited for NFT or drip systems, and granulated rockwool works well in buckets for hand watering and ebb and flow #2. Rockwool is versatile and can also be used in combination with other growing medium such as clay rocks to create your own high quality medium. Whatever medium you decide to use, just know that you can never go wrong with rockwool.